But while the phrasing of the report implies that both groups are diverging from each other in an act of mutual repulsion, closer examination of the data shows that what is actually happening is the growing radicalization of Democrat voters, either through ideological drift or the changing demographics of the Democratic voting bloc as it becomes less White. In some areas, like attitudes to continuing Black failure, Democrats have swung sharply Left, while Republicans have stayed roughly where they were. Democrats now increasingly accept the extreme Left shibboleth that America is an inherently “evil” society that uses entrenched, systemic, and largely invisible racism to hold back talented Black folks. 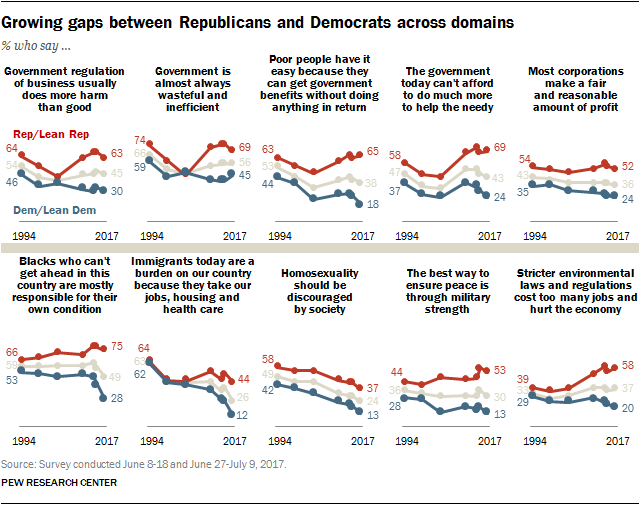 Where the groups have stayed closer together is in areas where Republicans have essentially cucked on their own views, and moved in the same direction as the Democrats, such as attitudes to homosexuality and the “general goodness” of immigrants. Regarding Black failure, the poll statement “Blacks who can’t get ahead in this country are mostly responsible for their own condition” shows Republicans agreeing, with a rise from 66% in 1994 to 75% in 2017. This is an increase of 9%, which is not surprising considering how much affirmative action has been rolled out in that time, including the country’s first “affirmative action” President. From an objective point of view, most of the excuses for Black failure have already been used up. But the number of Democrats agreeing with this entirely reasonable statement has sharply decreased, with a substantial drop starting in the Obama years — a drop of 25% points over the period, despite enormous amounts of welfare assistance and affirmative action. This means that Democrats have basically bought into the racist, anti-White, hard Left, #BlackLivesMatter narrative, and literally believe that Black failure is due to “White racism,” whether in the form of “micro-aggressions,” invisible “institutional racism,” or the “indelible legacy” of past racisms. Looking at the gay question, here the two groups of voters have stayed closer together only because Republicans have given up and started to embrace the same positions as Democrats. Disturbingly we see something similar with regard to attitudes to immigrants. The poll statement “Immigrants today are a burden on our country…” has seen a dramatic swing to the Left among Democrats. In 1994 62% of Dems actually agreed with this statement. This has now slumped to a measly 12%. Republicans have put up a little resistance here, but have basically moved in the same direction, going from 64% to 44%, a massive drop of 20% points. In 1994 both groups were opposed to immigrants by almost identical numbers, but today Democrats have become extreme advocates for immigration and all that it brings, while Republicans seem to have been pulled along in their wake. The real points of divergence between the two groups are in attitudes to environmental laws, government spending, and general welfare, where Republicans have moved to the right while Dems have swung left. Overall the Report presents a picture of a country that is generally drifting leftwards, pulled by the radicalizing elements in the Democratic Party, with Republican voters, as usual, attempting to be nice and avoid divisions by trying to placate Leftists, especially over anything related to race or gender, the hot button identity issues. Their focus instead is on lower government spending — or at least lower taxes — and looser environmental regulations. Big business and the globalists must be rubbing their hands with glee at how well their plan has gone. but maybe these polls are manipulated and even fabricated by the polling organizations? Are there criminal penalties for such acts? Nope. Is there possible civil liability? Nope. Will the media cover up for them? Yep. Count on it–those poll numbers are false. One question which needs to be answered is why are liberals so obsessed with race, specifically with blacks? The single mindedness with which liberals promote black interests go far beyond their past support for, say, the “underprivileged” and verges on fanaticism. One symptom is the liberal media covering up black violence, whether flashmobs out of the ‘hood, BLM pillaging expeditions or farm attacks in SA. In part, the liberal attitude is due to ideology. If liberalism worked in the real world, then America’s inner cities would be paragons of economic advance and civic mindedness, not burnt out post-apocalyptic wastelands. Similarly, post-colonial black Africa ought to be up to the level of a wine tasting soiree in Marin County, not a morass of one-party states and endemic tribal warfare. Faced with the failure of civil rights, and urban renewal, and war on poverty, and one-man-one-vote, and save the children, and buy the world a Coke(tm), liberals rewrite the script to blame the devastation on the nine billion names of “racism.” For the ideologue, reality is not quite their cup of tea. It is also due to fear. If liberals had to face sober reality, they would be looking at a world in which White people (like themselves) are being outbred and outnumbered by often pathologically violent competitors. And liberals lack whatever it takes to stand and fight for their own territory, whether in Detroit, Ferguson, Cologne or Chicago’s South Side. So they invent an ideological delusion in which blacks are the eternal victim. There is no reason to be concerned over a Nelson Mandela, a Trayvon Martin or a Michael Brown. You see, they’re actually teen honor student messiahs and honorary aviation engineers. The dilemma for liberals is that there is only so much territory they can cede before coming face to face with reality, whether in the form of a knockout king assault, a BLM riot or the trainwreck of attempting to educate a low median IQ demographic. The failure of half a century of liberal programs is percolating through the ideological fog. And this is why liberals are going over the deep end. Coming face to face with reality is enough to drive them mad(der).